“Unspoiled, rich, deeply rooted and full of potential” are some of the characteristics resident Kelly Frank offers when describing Boone County—a dynamic Hoosier community with a welcoming attitude for its future and a rich love for its past. The county’s past stretches far back to the establishment of its first settlement, at Thorntown, around the year 1720. A second settlement was created near Thorntown in 1827, with a third, bearing the name Jamestown, founded in 1829. It was in this year an act of legislation was passed in order to organize Boone County. The new county, named for frontiersman Daniel Boone, was officially established on April 1, 1830, with a population of 622. Jamestown was the original selection for the county seat, but a state law called for a county seat to be positioned within two miles of the heart of the county. This new ruling led to the establishment of a new site, Lebanon, which became the county seat in 1833. Between 1830 and 1840, Boone County’s population surged, ultimately reaching 8,121. This significant influx was most likely attributed to the county’s rich soils and quality timber, accompanied by the continuation of the Madison and Indianapolis Railroad to Lafayette through the area. The growth in population persisted until 1890, when it hit 26,572. Over the next 70 years, this statistic remained constant, but by 1960, it was again on the rise—and still is to this day. In fact, today Boone County is home to well over 53,000 residents—a number expected to surpass 60,000 by 2020. While Boone County is experiencing tremendous growth, it has worked diligently to craft a plan that will welcome imminent future growth and development, all the while maintaining its charming rural character and peaceful lifestyle. The Town of Advance may be a small one, but it is packed with personality. Just about 600 residents call this town home and enjoy all it has to offer. Each year it is host to the Advance Labor Day Festival sponsored by the Advance Volunteer Fire Department. Advance Community Park, a relatively new addition to the area, comprises a children’s play area, a half-mile fitness trail and a new skate park that was officially opened to the public in August 2008. Another guardian to the children of the town is the Western Boone Community Schools. 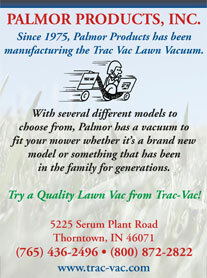 Simply, Advance is looking to further progress as a town and grow into its future with thoughtfulness. The town of Jamestown, fondly referred to as “Jimtown” by its long-time residents, was established in 1830. The modest community of around 950 residents enjoys a location within the southern portion of Jackson Township, on the west bank of the Eel River. This family-friendly locale also provides Jamestown quick access to nearby Interstate 74 and several state routes, along with an abundance of outstanding amenities through larger neighboring cities. The town is well-served by the educational excellence of the Western Boone Community School Corporation and is within one hour of outstanding institutions of higher learning. Adding to the landscape of Jamestown are the recreational diversions afforded through Downtown Park featuring a picnic area, a basketball court and playground equipment and the 16-acre Pleasant Acres Nature Park, which boasts a great trail system and opportunities for picnicking. The Tomahawk Golf Course is just a half-mile outside of Jamestown, affording golfers excellent chances for golf play. The community, which most likely received its name from the tall hickory trees that reminded County Commissioners of the Bible’s “Cedars of Lebanon,” was officially established on April 30, 1830, and was designated the county seat in 1833. A two-story brick courthouse was constructed in 1839 and replaced in 1856. This courthouse stood until 1909 and was ultimately leveled in order to accommodate the current structure—completed in 1911. This historic building is a true testament to Lebanon’s early innovation, as it features large columns believed to be the largest of their kind in the world, the second-largest stained glass dome in the state and eight rare Hahl pneumatically calibrated clocks. Further historical points of interest discovered in Lebanon include the Lebanon Public Library (a Carnegie Library opened in 1908); the Andrew B. Van Huys True-Circular Barn (circa 1912-1913); the Cragun House (home to the Boone County Historical Society); and Lebanon Memorial Park, a site dedicated to the veterans of World War I. Visitors to this amiable little town are pleasantly surprised by the sites to see, stores to shop, and history and culture to experience. Experience the nightlife at Mel’s Drive-In Theater, one of the oldest drive-ins in the state, or take a walk on the Thorntown Keewasakee Trail, a segment of the Farm Heritage Trail System. Tom Johnson Park’s amenities include horseshoe pits, picnic facilities, little league baseball diamonds and a playground, while the Lions Depot Park hosts many festivals, community events, public programs and more. Many historical treasures are discovered while walking the streets of Thorntown, from the bygone-era structures reflecting the architecture of the late 1800s to the long-time residents bursting with stories of the past. The Thorntown Heritage Museum is a fantastic resource, as it’s brimming with an extensive collection of artifacts that tell the story of early residents. President Lincoln’s train stopped in Thorntown in 1860, and his funeral train passed by, leading the Thorntown Community Organization to apply for an Historical Marker for the location. The historic E.R. Jacques building has hosted numerous industries in its 130-plus year history, serving as a fur trading post, a cheese factory, a garment factory and now as a home for the Sugar Creek Art Center. Adding to the historical lore of Thorntown is Anson Mills, a native son of Thorntown, born in 1834. This soldier (he fought in the Civil War and the Indian Wars), inventor (he invented a woven cartridge belt for carrying ammunition that is still used to this day), and explorer (he planned out the city of El Paso, Texas) played a significant role in Thorntown. Mills planned and financed a new water and sewage system for the town in 1909, built a large fountain in the middle of Market and Main Street, and gave two drinking fountains to the people—one of which remains in the garden east of the Thorntown Heritage Museum. Located directly off I-65, the Town of Whitestown is experiencing unprecedented growth and development. In fact, the Indiana Business Research Center lists Whitestown as one of the fastest-growing communities in the state, exhibiting a growth rate of 51 percent. And it’s no wonder, with the presence of the new Anson development and a Main Street Program led by high-performing members dedicated to the revitalization of Whitestown. Business remains strong, as residents continue to demonstrate their entrepreneurial spirit. New and established businesses come together, forming a true partnership that grows stronger each day. Recreation is also a leading component in Whitestown, thanks to an active Parks and Recreation Department. The Department held their first annual 5k walk/run on October 4, 2008. The 11.2-acre Whitestown Lions Club Park is now home to many amenities and plays host to a number of events and programs each year. The community has been working to rejuvenate and modernize the park’s facilities. From cleaning up the landscape and renovating buildings to installing new playground equipment and furnishing the ground with over a dozen new picnic tables, there is still more to tackle. In addition, avid polo players will find a perfect opportunity to compete at the Hickory Hall Polo Club. Just 20 minutes northwest of downtown Indianapolis, the tight-knit community of Zionsville enjoys the benefits of all the services of a major metropolitan area, while successfully maintaining its distinct small-town charm. The upscale town of more than 12,000 takes pride in its historic essence, which is noted through its lovely brick Main Street, attractive homes and friendly neighborhoods—all the while taking advantage of high-quality resources through the town government, the highly rated Zionsville Community School Corporation, Witham Health Services and St. Vincent Health. The Sullivan Munce Cultural Center, the Off-Main Street Players and one of the largest toy museums in the country are located here, as are a number of parks featuring such amenities as trails, equestrian opportunities, athletic fields, playground equipment and more. The town’s business sector is strong and growing—an aspect that is evidenced through Zionsville recently being ranked among the best towns to open a business in the U.S. by Fortune magazine in its April 2008 issue. 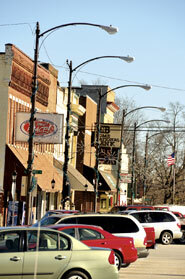 Central to the town’s economic success is its unique brick Main Street, recognized as one of the very few remaining main streets of its kind in the country. 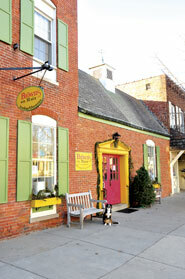 Dozens of shops line the main street, representing everything from upscale boutiques to vintage antique stores. Delightful restaurants and quaint cafes are nestled between these shops, offering an all-round shopping and dining experience for patrons.